What Salesforce Triggers and Actions are Supported? Can I Trigger from Updated Objects on Salesforce? I'm getting an OAUTHAPPBLOCKED error when I try and connect my Salesforce account. New Case - Triggers when a new case is created. New Account - Triggers when a new account is created. New Campaign - Triggers when a new campaign is created. New Lead - Triggers when a new lead is created. 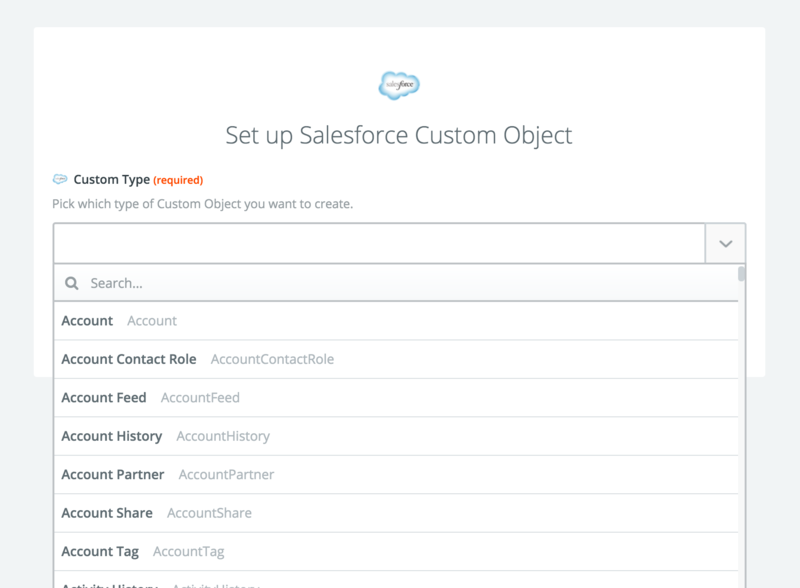 New Custom Object Type - Triggers when you add a new type of custom object to Salesforce. Typically you want to use the "New Custom Object" trigger, not this. New Custom Object - Triggers when a new custom object (of the type you choose) is created. New Note - Triggers when a new note is created. Updated Opportunity - Triggers when an opportunity is updated. New Outbound Message - Triggered when a new Outbound Message is received. Closed Opportunity - Triggers when an opportunity is closed. New Folder - Triggers when a new folder is created. 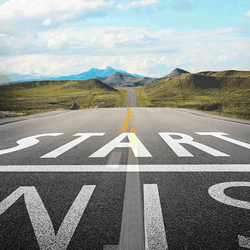 New Opportunity - Triggers when a new opportunity is created. Create Case - Create a new case. Create Account - Create a new account. Create Task - Create a new task. Create Campaign - Create a new campaign. Create Lead - Create a new lead. 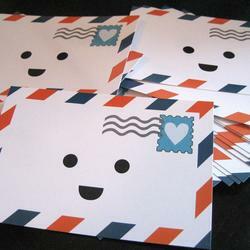 Create Note - Create a new note. 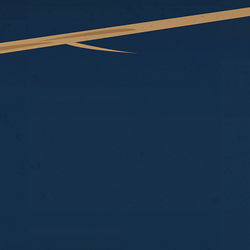 Add a Lead to a Campaign - Add a lead to a campaign. Create Custom Object - Create a new custom object (of the type you choose). 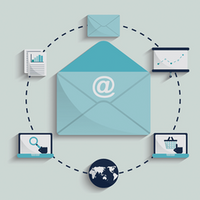 Add a Contact to a Campaign - Add a contact to a campaign. Update Opportunity - Update an existing opportunity. Create Case Comment - Create a new comment on a case. 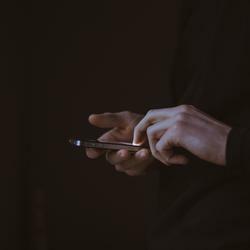 Update Contact - Update an existing contact. Update Custom Object - Update an existing custom object (of the type you choose). Update Lead - Update an existing lead. 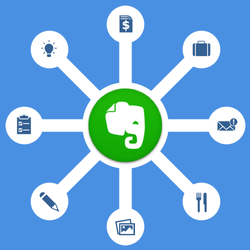 Create Document - Create a new document. Create Opportunity - Create a new opportunity. Create Event - Create a new event. Create Attachment - Create a new attachment (max 25MB). Find a Case - Find a Case by a field and value you choose. Find an Account - Find an Account by a field and value you choose. Find a Contact - Find a Contact by a field and value you choose. Find a Campaign - Find a Campaign by a field and value you choose. Find a Lead - Find a Lead by a field and value you choose. Find a Folder - Find a Folder by a field and value you choose. Find a Custom Object - Find a Custom Object by a field and value you choose. Find an Opportunity - Find an Opportunity by a field and value you choose. Find an Event - Find an Event by a field and value you choose. 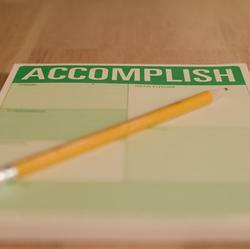 Find a Task - Find a Task by a field and value you choose. 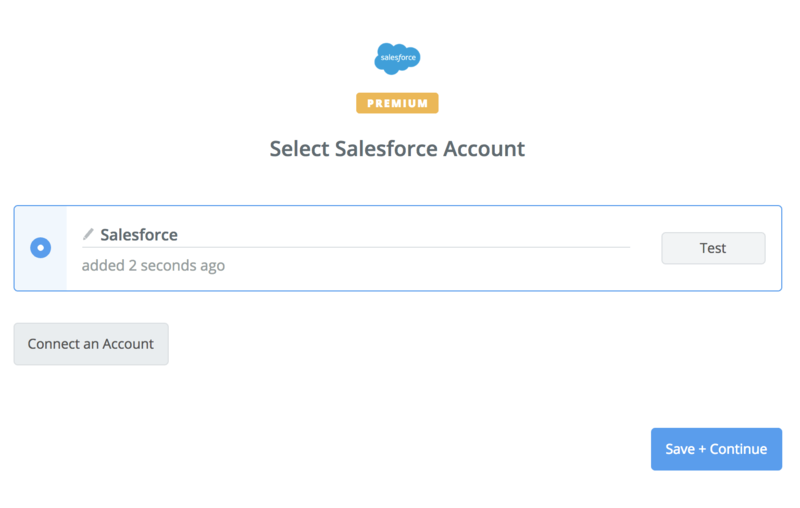 When you start creating a Salesforce Zap, you will be asked to connect your Salesforce account. 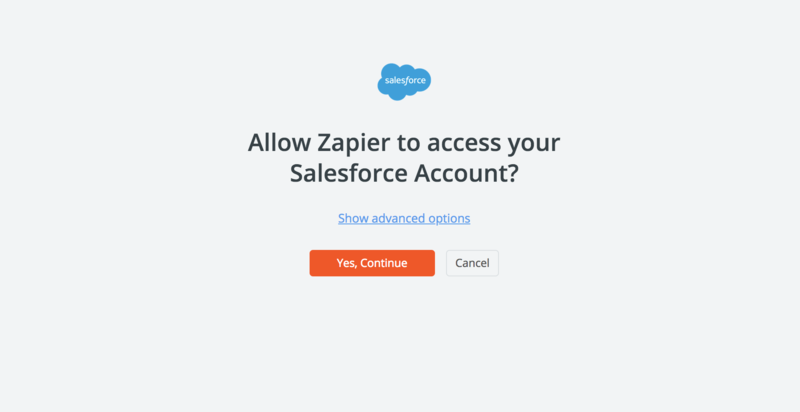 Next you will be asked to allow Zapier to have access to your Salesforce account. 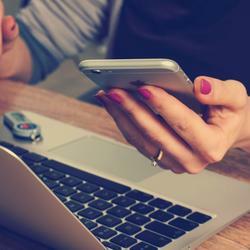 You’ll now be asked to log into your Salesforce account (unless you are already logged in). 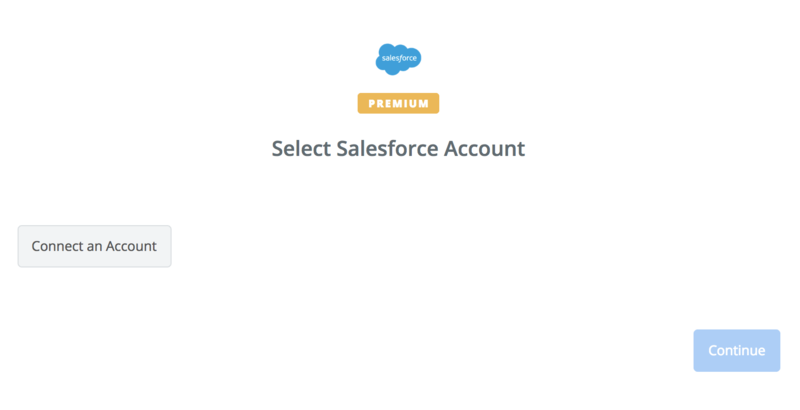 If all steps were successful your Salesforce account will now be successfully connected. Salesforce is very well supported on Zapier. You can Trigger off the creation of any object inside of Salesforce, including Custom Objects which might have been installed by another 3rd party application. Likewise, you can create any object inside of Salesforce as an Action. If the object type you want to Trigger off of, or create, isn't visible inside the dropdown menu, choose the "Custom Object". Later on inside the Zap editor, you'll be given the chance to decide which Custom Object you want to Trigger off of, or create. This is a somewhat common class of errors for Salesforce, which might manifest itself when working inside the Zap Editor or when receiving automated alert emails. Timeout errors indicate that Zapier's request to Salesforce took too long to get an answer. Lots of data (think: enterprise level) in your Salesforce Account, specifically of the type you're trying to access. Ephemeral outages or Salesforce API issues. Check our API Status Board for possible issues. Most of the time these errors are transient and you simply need to wait a while. If the error happened for an On Zap on the Trigger side (ie. Salesforce as a Trigger), you can safely ignore it (we will automatically recover this scenario). If the error happened for an On Zap on the Action side, you can attempt to replay failed Tasks within our Task History interface. 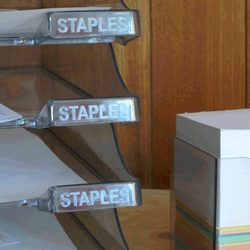 Right now, Salesforce can trigger up to 200 items at one time. If you attempt to add more than 200 items at once, Zapier will only be able to see the last 200. Sometimes when you add custom fields or objects in Salesforce, they won't show up right away in the portion of your zap where you map trigger data to the action template. An easy way to fix this on the trigger side is to submit a new entry with those custom fields filled in. We don't yet support the standard Middle Name and Suffix fields that Salesforce released in 2015. A workaround is to create custom fields for the Middle Name and the Suffix. We plan to upgrade this in the future so the standard fields are available. We do not support Salesforce communities at this point in time. That error means that the number of times Zapier is allowed to ask Salesforce for data has been exceeded for your connected account. That info can be found in their documentation here. Upgrading to a Salesforce plan with more users and higher request limits will stop this error from occurring. If you're getting a Field Integrity Exception error, it means that you're trying to connect a person using the Related To field or an object using the Name field. If you want to connect the task to a person (like a contact or lead), use the Name field. If you want to connect the task to an object (such as an opportunity or an account), use the Related To field. Pick the correct field and select "Use A Custom Value," then pass the ID of the person/object from a previous step. 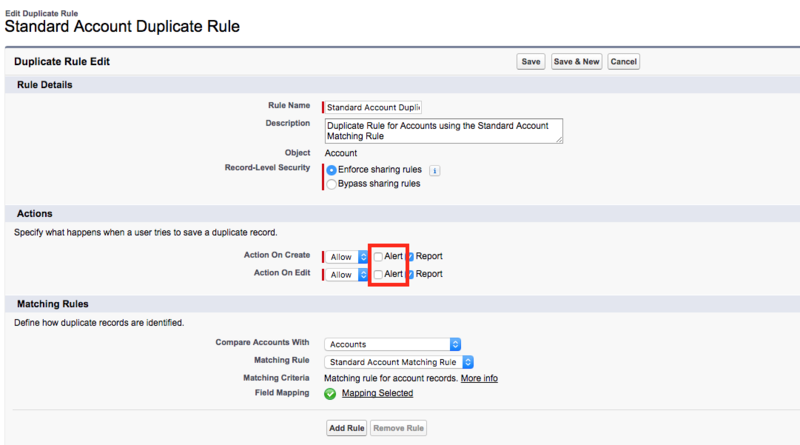 Here is an example of a "Duplicate Rule" for Account objects. If the Actions are set to Alert, the rule will block these "fuzzy duplicates" from getting created (and throw the error above). Unchecking the Alert box will allow the "duplicate" to be created. Salesforce's help docs cover duplicate rules for other objects. Salesforce search actions will return the most recently created record that meets the search criteria, even if there are multiple records that match. The Create Note action adds notes to the legacy 'Notes & Attachments' (also called "Classic Mode") function in Salesforce. The notes are not viewable in the new HTML version of Salesforce. When using the Create Event action, if you just want to specify a Due Date, use the Due Date Only field. If you want to specify both a Due Date and Time, use the Due Date Time field, but fill in both a date and a time. If you only put a time in this field, you'll end up with an event on today's date at that time. Or if you're passing data from a previous step, you can use the Formatter to build a string with ; as the separator. While there is only a Trigger for updated opportunities, you can get more targeted results by using the New Outbound Message Trigger. This uses Salesforce workflow rules, which allows you to set the filtering criteria on the Salesforce side of things. Please note for this handy workaround, your Salesforce account must support workflow rules. Firstly, create a Zap using the New Outbound Message Trigger. This trigger will create a webhook you can use on whatever workflow/trigger you want in Salesforce later. 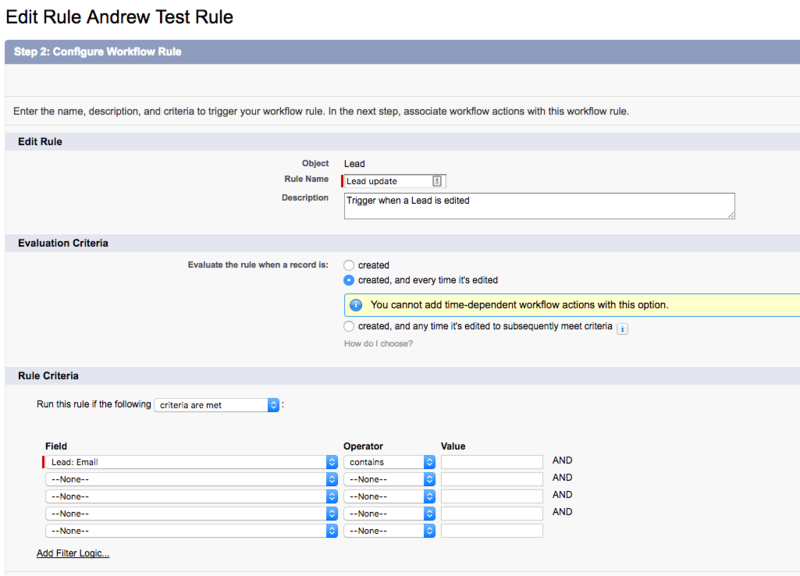 Next, in your Salesforce setup area, you will need to create a new Workflow Rule. 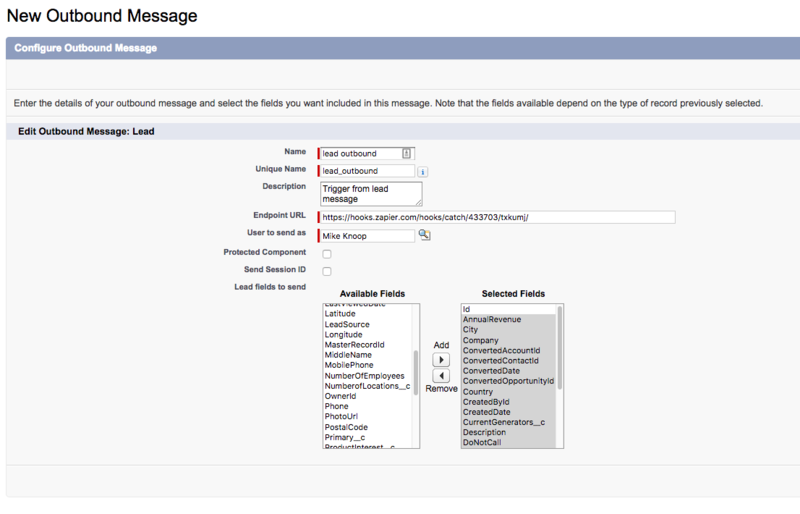 This rule will allow you to set the conditions that will trigger the outbound message to be sent out. This is what will trigger your Zap. 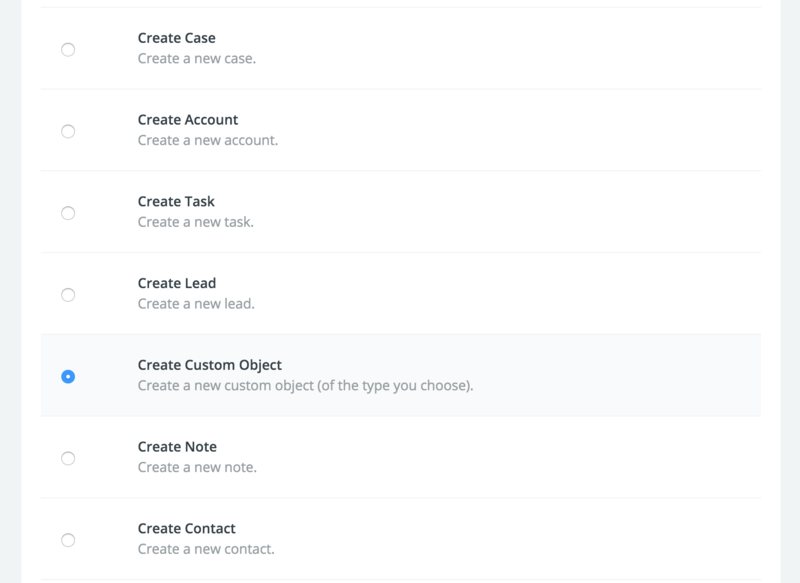 In the example below, this workflow will trigger when a lead is updated: You can read more on creating workflows on Salesforce here. 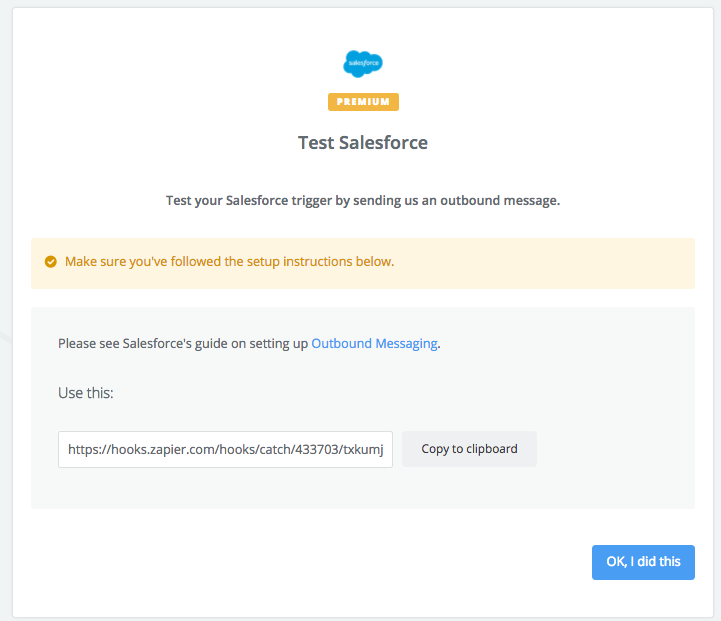 You can read more creating new outbound messages on Salesforce here. When you have done that you can come back and finish setting up your Zap. 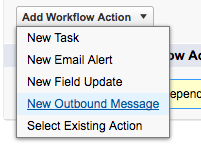 This workflow will send an Outbound Message when your workflow triggers, which will trigger your Zap! If the "Action" button for the Zapier app says "Unblock", then this Connected App has been blocked. 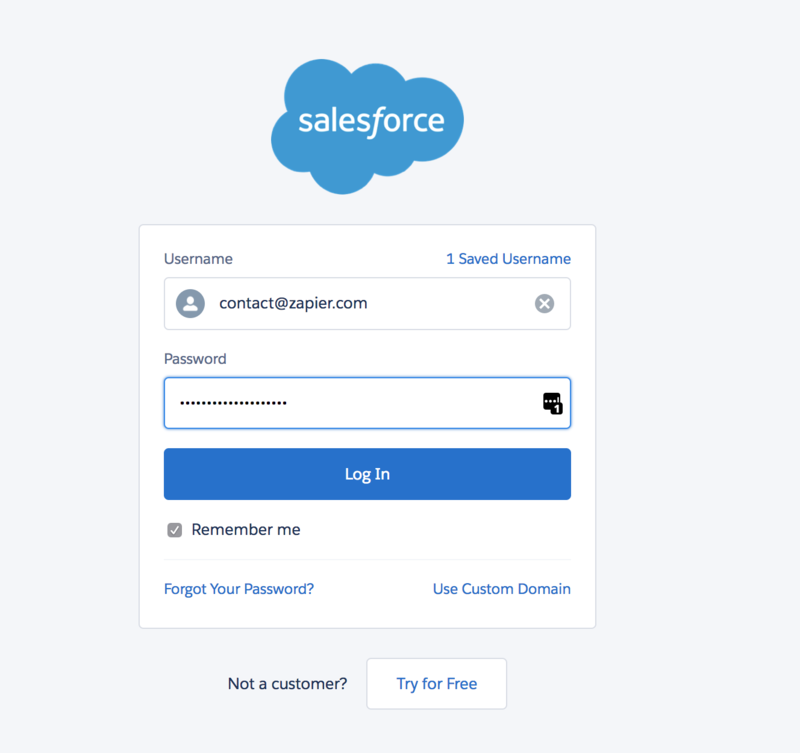 To proceed, review the dialog box that appears and click "OK"
Unfortunately at this time Salesforce accounts using Custom Domains are not able to connect up to Zapier.